Barkcloth, no it isn’t part of training your dog! 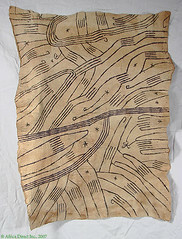 In this era of wearable art consider barkcloth. Bordering somewhere between vintage and collectible, barkcloth is very utilitarian with its’ tactile design and, because of wearable art in apparel and its’ many applications, is experiencing a design renaissance. The added bonus is that it can fit into most decors since barkcloth was made during several design periods in the 20th century. Starting in the 1920’s, the cloth with origins attached to the tribal design movement in France, had a nubby texture with noticeable slubs since it was made of densely woven cotton fibers. 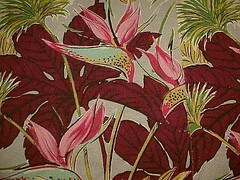 Most of the barkcloth of this era are floral designs. In the 1930’s, barkcloth began to be made in the United States. Early motifs centered around tropical designs and were indicative of the growing interest in hawaiian and japanese designs. Barkcloth became a staple in home design and was used for drapes and curtains, upholstery, and slipcovers. In the 1940’s, sailors saw these brightly colored barkcloth curtains and other home furnishings and shirts and brought or sent them home. In the following decades — the late 1940’s through the 1960’s, barkcloth became a popular fabric in the home interior textiles market. Usually the process from 1930’s-1950’s involved vat dyeing. 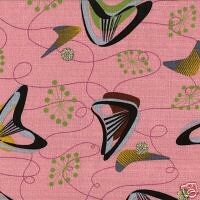 The most collectible of these barkcloths are the atomic "Eames era" prints popular in the 1950’s and early 1960’s due to interest in science and the race to the moon. In the 1960’s barkcloth reflected a hawaiian floral motif, and in the 1970’s took on a more modernist optical look–almost psychedelic. Barkcloth comes in many fibers, predominantly cotton, but also in linen, to rayon, polyester and fiberglass, depending on the age of the fabric. Vintage large pieces can be found in drapes and prices will vary according to condition, quantity, and popularity. Where to look for barkcloth? Retro outlets and shops, and Ebay™ are your best sources for variety and selection; however, you may get lucky from time to time at an estate or garage sale. The many uses of barkcloth include draperies and curtains, furniture upholstery, slipcovers, pillows, headboards, lamp shades, accessories and apparel. One great pattern for an apparel application and utilization of smaller pieces of barkcloth Markdown Mom found is the Pacific Rim Vest & Coat at Nancy’s Notions®. Beautiful and durable, a coat made from barkcloth material could easily go from day wear to evening wear! Tip of the Week #39: How To Get That ‘Golden Globe’ Glow! What do Mariah Carey, Britney Spears, and Jessica Alba all have in common? A fabulous tan! Mariah Carey has recently told fans that she and Jenny Phillips will be selling a gold tanning spray containing real 24kt gold dust. On her “Emancipation of Mimi” tour she sported the new gold look to advertise the launch of her new cosmetic line. However, if you are like Mariah and need to spray the tan on every night to achieve the same look, the gold dust tan could amount to real huge chunks of gold. MarkDownMom has found great products that will give you the same gold tan but at a fraction of the cost. 1) Samy Salon 24kt Gold Gel. MDM loves this product! The Samy Salon 24kt Gold Gel can be worn on skin and also on hair to get the full bronze diva look. The 24kt Gold Gel may be hard to attain, but can occasionally be found at ebay™. MDM found a lot of three Samy Salon 24kt Gold Gel bottles for $31.49, well worth the price! Click Here To Bid! 2) GlowFusion Airglow Air Brush Gun and Micro Nutrient Tinted Tan Refill Cartridge. This is the same product that Jessica Alba reportedly uses. GlowFusion is used to give a flawless and seemless tan without the exposure to the sun. There is no need to smooth the tan after spraying or wait for the tan to dry, the spray dries on contact. Both the Air Brush Gun and Refill Cartridge can be purchased at Sephora. GlowFusion Airglow Air Brush Gun costs $175.00 and Micro Nutrient Tinted Tan Refill Cartridge is $62.00. Tip of the Week #21 Online Auctions and Best Offers–Bid, Buy, and Now Barter! A next step in the evolutionary processs in online auction deals is the use of the "Best Offer." Relatively new, this brings another dimension to the entire online auction experience. Some dealers list Buy Now prices during the bidding process, and with this we enter the barter arena with the addition of "OBO" (or best offer). Many of us are familiar with this barter process in the classifieds of our local newspapers, or at local flea markets and estate sales. Online it is slightly different. 1. For one thing, Email is used instead of one-to-one contact with the seller. For some this may make it easier, for others it might present problems such as timing, and to a large extent timing is everything. If the item has not been bidded on, or the bidding amounts are low and remaining bidding time is short. If there is a "Buy It Now" price, and the current bid is low. If the item is very popular like the PS3 was for the holidays, you can make an offer that is more than the retail price was, but within your budget. This is for those people who ‘Have to have it NOW!’–you know who you are. The item did not sell and will have to be relisted. This is probably the optimum time to make an offer, but remember, don’t insult the seller with a ridiculous offer, make it reasonable considering the original retail price, condition, popularity, etc. If the item did not sell because of a "reserve," email the seller to see what her/his best price would be. 3. What $hould you offer? Well, that depends if you have done your research on the item. How popular is it? Again, like the PS3 or Wii, if supplies are low, you will have to pay above retail. The rarity of the item also comes into play when making your offer. Or you may get lucky and be the only one that sees the real value of the item. For Antiques and Art there are reference materials. Nothing pays off more than education. Do your research. MDM often goes to online auction sites and takes a look at high bids or listings that are unfamiliar–all the time increasing her knowledge not only for online auctions, but for local sales, thrift store finds, and so forth. Shipping. Bidders can be turned off at the expense of paying beaucoup bucks for shipping the article. Always factor that in your bid or counteroffer–shipping is negotiable. Furniture is more difficult to sell online because of shipping unless it is museum quality or the bidder lives near the seller and can personally pick-up the merchandise–if this is the case be sure to ask. You can sweeten your offer by making immediate payment, or making a condition that money order will be sent in 24-48 hours after reaching an agreement. 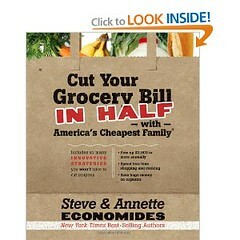 Of course, you are safer with paying on line with credit card which allows you recourse should the deal go sour. The technique of hand-painting and then glazing pottery was a significant evolutionary technique for Tennessee’s Southern Potteries in the 1930’s. Free hand painting on bisque pottery then applying a glaze over the design before its’ final firing in a kiln was an innovation over transfer or decal-decorated pottery. Local girls and women were hired to produce this dinnerware marked by its bright, whimsical designs and colors. WWII up to the early 1950’s, with its imports restrictions, marked the heyday of Southern Potteries Blue Ridge dishware. In January of 1957, Southern Potteries closed its’ doors, and its’ molds were purchased by Clinchfield Artware Pottery and reproduced for a few years more. 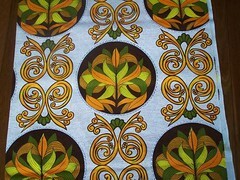 Some designs take on the appearance of French Quimper like the "Calais" style or Shabby Chic with its "Chintz" design. The pieces holding the greatest value are pieces with a woodland theme or unusual items such as jugs, boxes, or platters signed by the artist, or limited items in a set, i.e. teapots, candy dishes, etc. There are not always "marks" to identify this type of pottery, but collectors eventually have an eye that quickly identifies the piece from its’ design or mold shape. Most "marks" are either by Southern Potteries, Inc., Blue Ridge or Clinchfield. A chief designer Lena Watts in later years worked for Stetson China Company, and that is why you will find similar design elements in their pottery as well. Reproductions have occurred and must be watched out for, and not to be mistaken by the jobber or wholesaler marks that were placed on Southern Potteries products. The item pictured above left is identified as a bon bon shell in the "Nova Rose" pattern is being auctioned on Ebay™ with a current bid of $15.50 as of 02/06/07. A list price for Blue Ridge bonbon flat shell china is $55-$75. MDM has a Blue Ridge collection which includes a chocolate pot and a candy dish that were purchased from thrift shops a number of years ago. This dishware is becoming more popular, and prices are continuously increasing. However, with an astute and knowledgeable eye, occasionally you can uncover a "find." But like everything, MDM recommends that you do your research and buy the item in the best condition you can afford. One of the first design houses MDM became familiar with as a buyer was Paganne, Ltd. During the 70’s, they produced wonderful mod designs in Ban-Ion Nylon with each piece signed with Paganne’s logo. Color and designs ranged from wild to a subdued geometric print. These designs are still au courant and are especially collectible as wearable art as Hollywood and celebrities reintroduce vintage clothing on the runway. Ahead of their time, these wonderful fashions represent the high end of couture and are made from material that travels well and when worn, has a wonderful drape. On Ebay™ you can bid on these items and secure a fashion find at a fraction of the cost. Rachel Ray’s “Trash” or “Treasure” Bowls? You’re watching Rachel Ray and one of the noted differences between Rachel and Martha, is that Rachel collects all ingredients she will use from the cupboards, pantry, and refrigerator on the set–oftentimes placing them in a large splatter or confetti bowl. In making a particular dish, she will use this bowl for disposing of items, referring to it as a "trash" bowl. In keeping with the retro look of her kitchen, MDM believes that these trash bowls are Texas Ware, Dallas Ware and/or other Melmac dishware manufactured under various names including the famous designer, Russel Wright in the 1940’s-1960’s. This line of dishware made of plastic resin was virtually indestructible and inexpensive; however, it could stain, be scratched by metal utensils, and placed near heat, could burn and become charred. My children have broken several of my bowls, so they are not indestructibleThe combinations of colors strongly appeal to the kitsch or retro collectors and MDM has a few bowls from the 1970’s and collected others at thrift stores. MDM used to pick-up bowls for under $2, but it is becoming increasingly hard-to-find. Your best bet for rock bottom prices is to look for these items as yard sales. However, if you are looking for a particular piece for your collection then Ebay® is the place to go. Most prices for bowls start around $10, but pieces in colors such as purple, dark blue, or bright orange and green may be harder to come by and the prices will reflect that. MDM’s Ebay® Find of the Week: This bowl, photo above, is currently up for bids on ebay. Ailthough not signed Texas Ware, it is of the same vintage and is 8" in diameter, At posting, 0 bids with $7.99 opening bid requested,closes 10/25/06.